For 25 phabulous years, The Phantom of the Opera has been haunting Broadway audiences with its tale of a mysterious masked man and his wide-eyed musical muse. In honor of the show's big anniversary, Sierra Boggess is joining Hugh Panaro as Christine and the Phantom! Broadway.com resident artist Justin “Squigs” Robertson headed to the Majestic Theatre to experience the magic of the dazzling extravaganza, then sketched a passionate portrait of composer Andrew Lloyd Webber (bottom left) with Phantom stars past and present (clockwise from left): Sarah Brightman (original Christine), Michael Crawford (original Phantom), Panaro and Boggess. 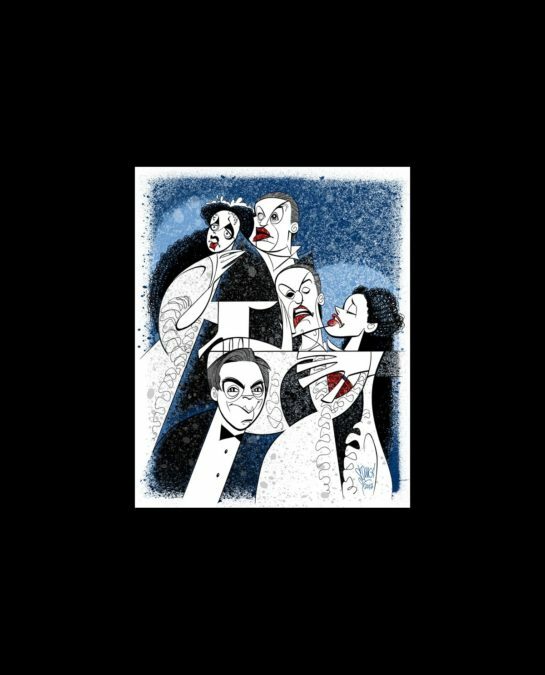 Get a closer look at Squigs' newest work of art above, then catch the 25th-anniversary cast of The Phantom of the Opera, celebrating their momentous milestone on January 26!